How often have we been in a classroom, intent on being as helpful and constructive as we can, only to nd that some students are resistant or silent or respond in totally unexpected ways? Even when we fully intend to respect the diverse cultures of our students, we are nevertheless entrenched in our own and cannot always control our unconscious reactions to differences that are strange, unfamiliar or even unsettling. I’d like to present a brief overview of some highlights from cross-cultural studiesand relate them to my own experiences teaching ESL in Canada which I began professionally in 1976. 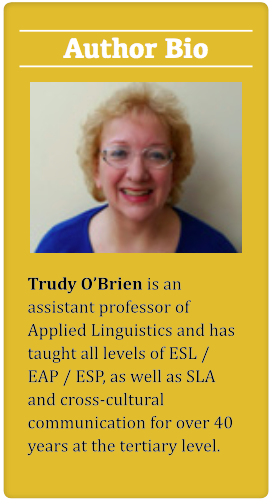 Since then I have also taught courses in applied linguistics, including undergraduate and graduate courses in cross-cultural communication. Over the years, my understanding of the need for clear theoretical guidelines has been augmented by continuing to work with international students and colleagues here and overseas. Our worldview is inevitably grounded in how we are exposed to and taught the cultural values we adhere to. Whether we accept the stronger or weaker version of the Sapir-Whorf hypothesis (i.e., that culturally based worldviews affect language and vice-versa; see Hoijer, 1985, for a good overview), we cannot deny that we must learn to recognize and appreciate points of similarity as well as differences in how we approach tasks, interpersonal exchanges and roles. Geert Hofstede’s study (1991) suggesting the key dimensions that control cultural perspectives may offer some guidelines to our own and our students’ reactions. His large-scale study of IBM culture worldwide in over 50 countries revealed that each section of the company could be understood as a representation of the national/group culture of the region it was based in. Hofstede proposed that differences could be seen along the lines of various continua: individualism-collectivism (relationship of the individual to the group), power distance (the degree of acceptance of social and political hierarchies), masculinity- femininity (the extent of nurturing versus aggressive responses to others), and uncertainty avoidance (the degree of tolerance for matters one cannot control). Hofstede later considered long-term orientation and indulgence as additional factors in the analysis, but his main dimensions remain the key features for cultural comparisons, despite much debate over their generalizability. In ESL classroom terms we might think of students who prefer the teacher to be an authority gure and strong guide rather than a facilitator who allows too much exibility in responses or tasks. Some students who expect personal favours in class are not trying to “cheat” but rather are adhering to the roles of ranked interrelationships and mutual dependency. Or we could think of students who cannot work easily in groups and prefer to make and defend their own decisions. Other cultural concepts that might explain our students’ behaviour include Hall’s (1976) analysis of high and low contexts. Japanese students who read broader and indirect signals in a situation and reply in very vague ways are used to the subtleties of a high context culture, while our German students might prefer explicit and direct instructions with no room for ambiguity. This can also relate to non-verbal mannerisms which are not familiar to all in the classroom. A former male student who was quite devout in his religion almost never looked me directly in the eyes, keeping his head down while answering, and never using my rst name. While his behaviour could have been interpreted as insolence or simply shyness, I appreciated his respect for an older woman in charge of his class. Nevertheless, I confess I really wanted to lean down to look up into his face and say: “Please, look at me!” Of course I never did so, but it supports the point that even an understanding of a well-meant cultural gesture does not mean we can control our inherent responses to behaviour that is at odds with what we are most familiar with. Silence, too, can be misinterpreted; as noted, apparently silent shyness may actually be a sign of respect for authority and does not mean the student is incapable of speaking. In some cultures a pause than is longer than expected from the listener before responding shows the listener’s respect and consideration of the speaker’s words rather than an attempt to ignore or disregard the message. Burgoon’s expectancy violation (2005) may also explain why students react so strongly when something “goes wrong” from their perspective: entrenched expectations about what is proper, usual or comfortable can provoke unexpected reluctance to engage in tasks or to accept those who don’t talk or do things as they “should”. Although I am here focusing on behaviour, language inappropriateness is also clearly a feature that has roots in cultural understanding. Miscommunication at either a sociopragmatic or pragmalinguistic level is rather common. We are, I’m sure, familiar with cases where our “Bye, see you later” elicits a student’s “At what time?” or a request like “Do you have a light?” evokes a “yes” or “no” but no match or lighter. When I taught a group from Venezuela I received lovely sympathy cards as students tried to assure me they found me quite “simpática”. Or I’ve had students who email me with “Hey prof” even before they have met me in class and although I pride myself on being comfortable and relatively informal with my students, I still nd that rather grating. These are linguistic manifestations of cultural and social ignorance in the true sense of simply not knowing how to respond according to different cultural, social, and academic norms. Facework, as outlined so well by Stella Ting-Toomey and others (1994), as a cross-cultural take on Goffman’s (1972) and later Brown and Levinson’s research (1987) is also evident in how much we expect our students to dance with identity management. Years ago I was asked to help a graduate student in Geography prepare for his Master’s thesis defense. He was a Chinese speaker from Taiwan whose supervisor feared his very poor English pronunciation would jeopardize his oral. He and I worked for almost eight months, during which time a referral to a speech pathologist revealed not only that he was hard of hearing (and so could not hear either English or Chinese well enough to distinguish sounds as needed) but that he was also literally (physically) tongue-tied. He admitted that he had always been reluctant to seek help, even in Taiwan, since that would mean he would lose face and respect both at home and in his department. His initial shyness with me eventually faded and he did improve his pronunciation enough, but the supervisor’s initial concern was based entirely on an assessment of the student’s English speaking ability and not the underlying factors related to cultural expectations about face. The summary above only touches the surface of what a better notion of cross-cultural and inter- cultural communication can entail. I strongly believe that both teachers and students would bene t from a systematic and thorough exploration of the theories and cases of cross-cultural communication as they strive together to ensure full ESL proficiency and pragmatic competence not only within but also in front of the classroom. 1 For the purposes of this brief overview I use the term cross-cultural here as interchangeable with intercultural. Brown, P., & Levinson, S. (1987). Politeness: Some universals in language usage. Cambridge, England: Cambridge University Press. Burgoon, J. (2005). Expectancy violations and interaction adaptation. In W. B. Gudykunst (ed. ), Theorizing about intercultural communication (pp. 149–171). Thousand Oaks, CA: Sage. Goffman, E. (1972). Interaction ritual: Essays on face-to-face behavior. Harmondsworth, UK: Penguin. Hoijer, H. (1985) The Sapir-Whorf hypothesis. In L.A. Samovar & R.E. Porter (eds. ), Intercultural communication: A reader (pp. 210–217). Belmont, CA: Wadsworth. Ting-Toomey, S. (Ed.). (1994). The challenge of facework: Cross-cultural and interpersonal issues. Albany, New York: State University of New York Press.